One of the most recognized brands in the world, Purell defines the hand sanitizer category and is the brand most preferred by doctors, professionals and consumers everywhere. PURELL Instant Hand Sanitizer is a refreshing, alcohol-based instant hand sanitizer that kills 99.99% of most common germs that may make you and your family sick. Sanitize your hands anytime, any place! A recent study showed that healthcare workers sanitized their hands 20% more often when Purell was provided in a touch-free automatic dispenser! The TFX touch-free dispenser offers trouble-free performance with a three year guarantee. A large sight window allows for at-a-glance monitoring of refills. The TFX dispenser is fully ADA compliant. Operates with 3 C batteries. Choose between gel or foam hand sanitizer refills. Smart, trouble-free electronics eliminate battery changes in most installations. The LTX-12 touch-free dispenser offers high-capacity output with a lifetime guarantee. Fully ADA compliant. Converts to a locking dispenser (key included). Choose between gel or foam hand sanitizer refills. 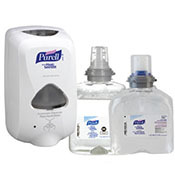 Make Purell Instant Hand Sanitizer available anywhere with this freestanding design. Ideal for high traffic areas. Compatible with both the TFX and LTX dispensers (sold separately). The ADX-12 push-style dispenser has a slim, high-capacity design. It is ADA compliant for protrusion into walkways. Lifetime guarantee. Converts to a locking dispenser (key included). Choose between gel or foam hand sanitizer refills. The compact design of this push-style dispenser optimizes wall space. Fully ADA compliant. Lifetime guarantee. For use wth 1000ml gel hand sanitizer refills. The compact design of this push-style dispenser optimizes wall space and releases a portion controlled amount of sanitizer to reduce cost-per-use. ADA compliant for push force. For use wth 800ml bag-in-box gel hand sanitizer refills. Kills more than 99.99% of most common germs that may cause illness. Outperforms other hand sanitizers ounce-for-ounce and is clinically-proven to maintain skin health. These are the perfect size for desks, counter tops and any other area that mounting a dispenser is not possible or convenient. Available in 8 or 12oz pump bottles. Kills more than 99.99% of most common germs that may cause illness. Outperforms other hand sanitizers ounce-for-ounce and is clinically-proven to maintain skin health. These are the perfect size for purses, diaper bags, vehicles and any other place where portability is a must. Available in 2 or 4oz flip cap bottles. Kills more than 99.99% of most common germs that may cause illness. Durable and non-linting. Removes light soils and dirt from hands while providing moisture to keep hands soft. Available in canisters for convenient placement around the office and home, and individually wrapped for on-the-go.